In a perfect four-wheel drift, Charles Leclerc slides his kart at speed around a tight hairpin bend. With his fingertips, the Ferrari driver beautifully balances his steering with throttle inputs. Everything seems ordinary until you look at the surface he's driving on. It's a sheet of ice. Wearing his now familiar scarlet Ferrari overalls, the Monaco-born racer is in his element, driving with precision and power on an ice rink normally reserved for speed skating. Right now, Leclerc is racing against the clock. His target laptime has been set by the world champion Chinese short track speed skater, Han Tianyu. It is the Wednesday afternoon before the 2019 Chinese Grand Prix - a landmark in the Formula 1 world championship as this weekend the race in Shanghai marks the 1,000th world championship round to be held since 1950 - and Leclerc is taking part in a PR activity organised by Shell on the eve of this historic race. Both Shell and Ferrari are both synonymous with Formula 1, having been there been there since the first race in 1950. Through Shell's innovative use of Shell V-Power race fuel and Shell Helix Ultra lubricant, they will once again be working to extract the maximum performance for Ferrari at this weekend's Chinese Grand Prix. As part of the celebrations for this landmark race, Shell have organised a showdown between Leclerc's kart - completed with studded tyres - and the blades of the Chinese short track skating world champion Han Tianyu. Lying before them is a skating rink with a course marked out with cones. In a test of performance, power and efficiency, the Shell Pursuit challenge brings to life some of the key benefits that the Shell Innovation Partnership brings to the Scuderia Ferrari team. The venue for today's time trial is on the fifth floor of a shopping mall, not far from the centre of Shanghai - one of the world's most populous cities. A stone's throw from the city's Hongqiao International Airport, the Bailian Xijao mall has everything you would expect. On the ground floor retail shops and food emporiums vie for space, but the top level is reserved for an ice skating rink. Last night a new piece of ice was laid especially for this one-off special The Shell Pursuit challenge and studded tyres were fixed to Leclerc's kart to give optimum grip in the extreme conditions. The ice-cold temperatures are no threat to Shell's Helix Ultra products, which are designed to work in extreme temperatures, be they icy conditions of -40C or the 1000C of a Formula 1 car. "It's a dream come true, since childhood I've always been looking up to the red cars and to be there already in my second year in Formula 1 is a great feeling," says Leclerc. "It's a big step up from last year and now I'm fighting for podiums most weekends. It's a great challenge. "The professionalism inside the team is incredible and there are a lot more people compared to the teams I've raced with before -but yes, very exciting to drive for Ferrari." By joining Ferrari, Leclerc admits he's come to understand the importance of Shell's Innovation Partnership, whether that's through their Shell V-Power race fuel or Shell Helix Ultra lubricant. "When I visited the Shell track lab I was able to get an understanding of the important role Shell has in analysing fuel and oil samples both pre- and post-race on the power unit, testing for performance and reliability. It helps the team a lot." 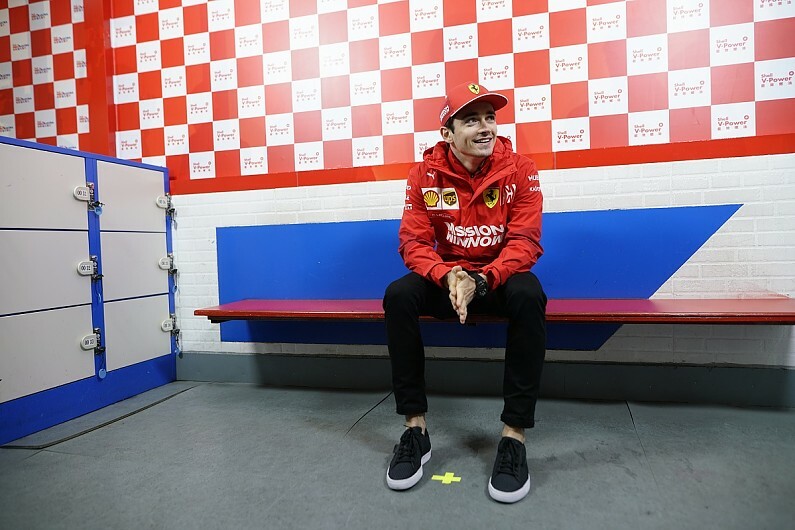 After the interviews are over, it's time for Leclerc to try and beat the 47.5 second lap achieved by the legendary Chinese world champion ice skater. After an exploratory tour, Leclerc's precision and power at the wheel of the kart eclipses that of the short track speed skater - but only just. Leclerc records a 45.1s to go nearly 2.5 seconds quicker. "It was not easy on the ice," he said grinning afterwards, "but it was a lot of fun..."